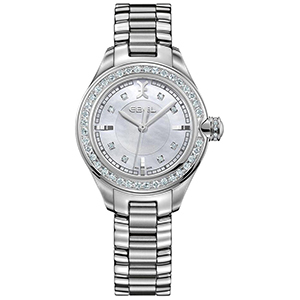 The Ebel Onde Stainless Steel Mother of Pearl Quartz Womens Watch Model #1216096 features a mother of pearl dial with silver-tone hands along with diamond hour markers. The polished stainless steel case has a polished stainless steel bracelet attached to it. The fixed stainless steel bezel holds the scratch-resistant sapphire crystal. The Quartz movement gives this analog watch great accuracy at time telling. The pull/push crown of the watch is easy to operate. The solid case back protects the internal mechanism of the watch from harmful outside elements. It has a deployment clasp with push button for a secure fit. Like all of our watches, this Ebel Onde Stainless Steel Mother of Pearl Quartz Womens Watch is Brand New, and comes in its original packaging! Founded in 1911 as a small workshop called née Lévy, Eugène Blum and Alice Blum laid the foundation for what was to become a global phenomenon. The name Ebel was created by combining the first letters of both the names of the owners. In the year 1932 the management of the company was taken over by Charles, Eugène’s son. Charles started to build up a sales network across the globe including countries like the United States. The 1970’s saw the company taking a drastic turn and went on to manufacture wrist watches. Throughout the years the company has been sold multiple times but the core values of the Blum and Levy are intact. Today, Ebel is well known for its bracelet designs and wave shaped links that are well-incorporated with contemporary elegance.